Photographed on the Thursday 30 June 2016. This micro moth is the commonly occurring Nettle-tap moth (Anthophila fabriciana) which occurs ubiquitously throughout the UK anywhere there is nettles (Urtica dioica) which is the food plant of its larvae. In fact it is so common it is also known as the Common Nettle-tap moth and occurs throughout much of the world and has a long flight season from late spring to autumn with at least two broods produced. The Nettle-tap belongs to Class Insecta, Order Lepidoptera, Family Choreutidae and Genus Anthophila. Moths comprise a group of insects that originated before butterflies, but to which they are related, both falling under the Order of Lepidoptera. There may be as many as 160 000 species of moths and many more yet to discover. Most are nocturnal though some are day flying and there are also crepuscular and diurnal species. 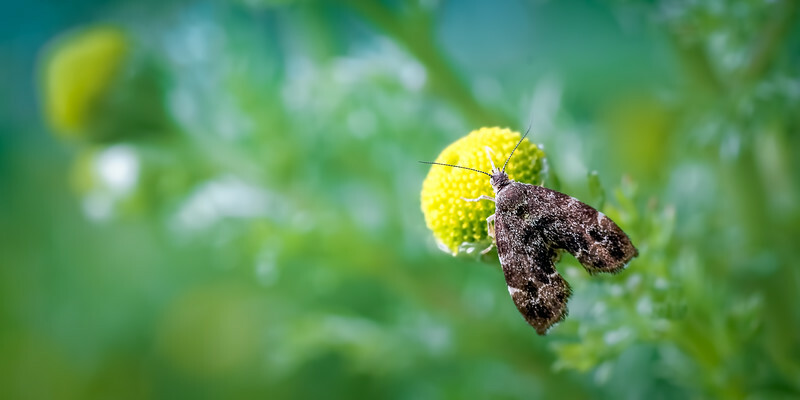 The well-known and disliked clothes moths were actually moths that inhabited birds’ nests originally and like many other moths are considered pests, many of which can be serious agricultural pests such as the diamond back micro moth. However, some moths are quite primitive and do not feed at all and many others feed on nectar, whilst others are actually farmed e.g. the silk moth. Moth trapping is also an fun, enjoyable hobby where moths are light trapped (also sugar ropes and pheromones) and then identified the following morning with the records going up to a national database through your local moth society, which occurs all over the world.